Dr. Fruin has been an active and contributing member of AFDO and AFDOSS for more than 16 years, and has dedicated 53 years of public service in various food safety roles, including 30 years with the U.S. Army. Having lived all over the world, he spent time running the only food inspection unit in Vietnam (providing support to the Army, Navy, Air Force, and Marine Corps), and served the U.S. Army in various food safety roles in Vietnam, Iran, Australia, New Zealand, Guam, Hong Kong, Thailand, Singapore and the Philippines. He retired from the military as a U.S. Army Commander. Dr. Fruin has served as a member of the National Advisory Committee on Microbiological Criteria for Foods, member of the editorial board of the Journal of Food Protection and consultant to the U.S. Army Surgeon General for Food Technology. He has authored (and co-authored) more than 80 manuscripts in peer reviewed journals, laboratory reports, and abstracts. He served the State of Florida as a Bureau Chief for 23 years, before retiring in 2016. In Florida, he was responsible for establishing policy, implementing enforcement of federal and state regulations and ensuring the direction of the program based on changes in regulations and technology for over 45,000 food establishments. Today, he continues to mentor those within the Bureau who carry on his vision. 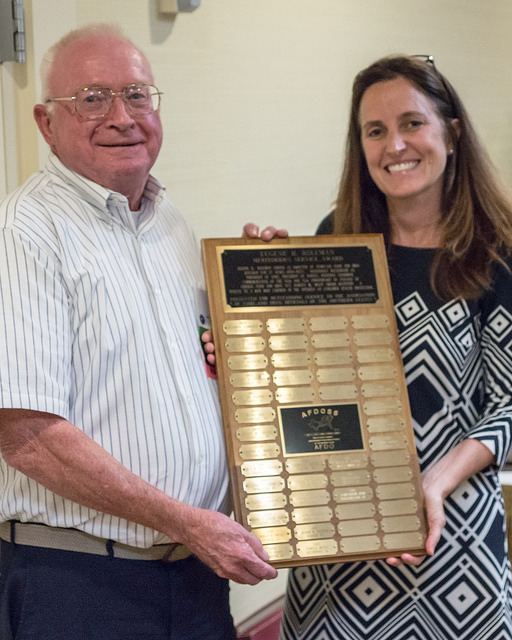 The Eugene H. Holeman award recipient is determined by a committee of five members from AFDOSS, who consider all nominations for the award each year and provide a recommendation prior to the Annual Education Conference. The five-member committee is determined by the AFDOSS By-Laws (Section 15), which states: “The Eugene H. Holeman Awards Committee shall consist of 5 members as follows: (1) the most recent recipient as Chairman, (2) the President of the Association and (3) the three past living recipients. If three members as described are not available, the President may appoint such members as necessary to fill all five positions. To be eligible for the Eugene H. Holeman Award, a nominee must have demonstrated that he/she has served the Association and made a valuable contribution to food, drug, cosmetic and consumer products and administration and enforcement. A previous recipient of the award shall not be eligible for re-nomination. The Committee shall consider each report of nomination, as received, and the committee members shall have the right to independently canvas the field in order that no one worthy of consideration is overlooked. The Committee shall make a recommendation but an award need not be granted each year. Just a few of the esteemed past recipients of the Eugene H. Holeman Award.